For millions of Falun Dafa practitioners around the world, the miraculous power of Falun Dafa is a personal experience and undeniable fact. This is why practitioners spare no time or effort to help more people become aware of the boundless positive impact that this high-level cultivation practice can have on a person’s life. The practitioners in Bulgaria are no exception, and they have undertaken the challenge to introduce Falun Dafa to the inmates of Stara Zagora Prison. It happened because of Nikolai Kolev, aka Koko, a Falun Dafa practitioner who years ago served time in the same prison. Koko shared with Radost Naydenova, manager of the prison’s Social Activities and Educational Department, about the great changes that occurred in his life after encountering and practicing Falun Dafa. 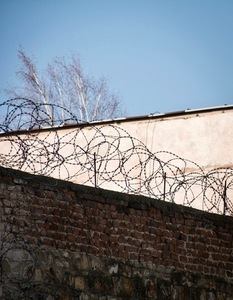 Witnessing his transformation, Radost Naydenova, accepted Koko’s recommendations to have the practice introduced in Stara Zagora Prison, in order to benefit other inmates who were serving time there. For two years, with the unconditional support of prison authorities, Dafa practitioners from the city of Stara Zagora have been holding weekly meetings for Fa study and exercise teaching sessions for those interested in learning the practice. Stara Zagora Prison currently has 15 Dafa practitioners. This article tells the story of one of them, named Kostadin – a prisoner who has already served 11 years of his life sentence. The article was written for Osem – one of the most prestigious Bulgarian magazines. It clearly demonstrates the power of Falun Dafa and the emotional changes associated with the choice to follow the principles of Truthfulness, Compassion, Forbearance. It reflects the determination of the human spirit to find the way back to freedom despite being confined behind bars. Cautiously entering through the iron gates of Stara Zagora Prison, we try to leave behind any prejudices of “free people.” We are about to meet with 47-year-old Kostadin Vassilev (known as Kozeto among his fellow inmates), who is serving a life sentence. He greets us with a smile and has a present for us: an origami lotus flower, symbolising cultivation and the pursuit of purity. Tall and neat, Kostadin also exudes purity. There are two wardens present, but Kostadin manages to quickly make us feel comfortable, and to ignore the concern of being in the presence of a convicted felon. He has accepted the prison as his home, but has he accepted his faith? Yes! Does he rebel against the legislation and the judicial system? No! Kostadin emanates endless humility, forgiveness, and understanding. Overwhelmed by his strong presence, we cut into the story. Kostadin talks to one of the article authors. For Kostadin, life before prison was fast-paced. He thrived on adrenalin and loved taking risks. He graduated from the police academy in Pazardzhik and became a policeman in his hometown of Tvarditza. Driven by a desire for a quick buck, he started his own business. He also started a family and had a good life, but something seemed missing. He became a truck driver and drove not only across Europe, but also Russia and Kazakhstan, where he caught a glimpse of Eastern culture for the first time. “I have accepted it calmly. Inside, I knew and I still know, that it will not always be this way, and that life will not continue the same.” Kostadin was sentenced to life in prison in 2008 and he is currently serving his eleventh year. “The first year I was detained in a jail in the city of Rousse. That was the hardest, really horrific, without daylight or a bathroom. I was preparing to sue the state.” Later, he was moved to Lovech, Vratza, Pleven, Sofia, Varna, and Bourgas. This is when he lost his family. His wife abandoned him and moved in with a detective who was his former co-worker and good family friend. His children were forbidden from contacting him. Kostadin was consumed by bitterness, anger, and desire for revenge. After numerous appeals, in 2014 he was finally moved to Stara Zagora Prison, where he is closer to his family and his parents. He was initially placed in a high-security area but a few months ago was transferred to the medium security area. “One day I was offered the opportunity to participate in a new group activity. I agreed out of boredom, but after learning what it was about, I knew it was something truly significant.” This is how Kostadin encountered Falun Dafa, and he realises that it was not by chance. Throughout the ages, people in China have been seeking ways to enlightenment but most of them have practiced privately. Falun Dafa is a traditional Chinese cultivation method from the Buddha School, and it aims to achieve enlightenment through mind and body cultivation. A cultivator needs to look inward and be willing to abandon everything bad and unnecessary, to embrace tribulations in life as a chance to improve and cultivate oneself. Falun Dafa includes five meditative exercises and teaches its adherents the principles of Truthfulness, Compassion, and Forbearance. On July 20, 1999, the Chinese communist regime initiated an illegal persecution of Falun Dafa, trampling people’s constitutional right of freedom of speech and belief. When Falun Dafa practitioners approached Stara Zagora Prison to introduce the practice to the inmates, the head office responded positively. Radost Naidenova – department manager at the Capital Directorate of Interior (CDI) and Nikolay Nikolov – detective at CDI, found Falun Dafa trustworthy since they had already seen the transformation of another former inmate – Nikolay Kolev (Koko), who currently lives and practices Falun Dafa in the United Kingdom. He personally called Radost Naidenova to tell her about the extraordinary ancient cultivation system that miraculously improves one’s character. Based on this endorsement, Stara Zagora practitioners were granted permission to do volunteer work with the inmates every Tuesday. Kostadin read all of the Dafa books. For a year he practiced alone and waited impatiently for his weekly exercise sessions with the practitioners and to share his experiences with them. Some of the other prisoners joined and gave it a try. Some stayed, and others have given up. But Kostadin is always there. “Thanks to the practice, everything turned around 180 degrees, and my perspective changed entirely. At the moment, it doesn’t bother me at all, the fact that I am serving life in prison,” Kostadin shares. “The only important thing is doing the exercises after I wake up, reading and to studying the Fa and practicing its principles, and everything else falls into place! He was worried about his parents, but after giving his 70-year-old mother a copy of the book Zhuan Falun, she started practicing, and he is no longer worried about her. His brother also supports his cultivation. 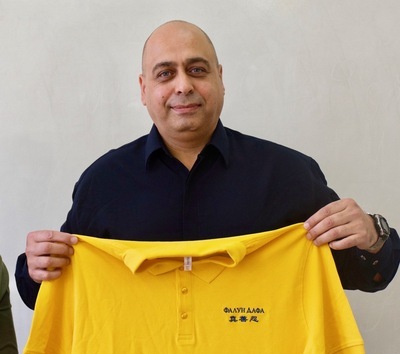 Kostadin holds a Dafa T-shirt. Four months after starting the practice, Kostadin managed to eliminate his health problems and the medications he was on. He quit smoking even though until then he smoked two packs a day. His cravings for meat, alcohol, and coffee have stopped. He takes cold showers regardless of the season. But even more remarkable are the changes in his realm of thought and perception of the world. He is no longer interested in worthless and temporary things. He realises that cultivation gives meaning to life. Being well aware of all the difficulties and diversity of other peoples’ characters in prison, he says, “The environment here is very favorable for cultivation and raising my spiritual level.” He managed to get rid of the anger and hatred in his heart, as well as the desire for vengeance. Eliminated also was his appetite to own things and to fulfill his desires. He also realised that he lost his interest in winning when playing board games. “I’ve noticed that the less I want to win, the more I am winning.” Kostadin is trying to apply Falun Dafa’s principles of Truthfulness, Compassion, Forbearance, in his everyday life. Kostadin shares that he still faces challenges when it comes to patience. He is very impetuous and says things without considering them first, then regrets the comments later on. But he is working on cultivating his patience. And the prison management appreciates his responsible attitude – he is allowed to have bookshelves and a meditation mat. He has also been given extra responsibilities, such as being in charge of newcomers and helping inmates who have difficulties adjusting. Kostadin is aware that his behavior makes other prisoners more respectful towards him. Thanks to his attitude toward his life sentence, he manages to comfort and give them assurance that they also will be able to deal with the situation. He noticed that when he walks into a room, he seems to harmonize the whole space and calm everyone down. The other inmates pay more attention to what they say in his presence and behave in a more kindly manner. “They are quieter even when passing by my cell,” he notes. 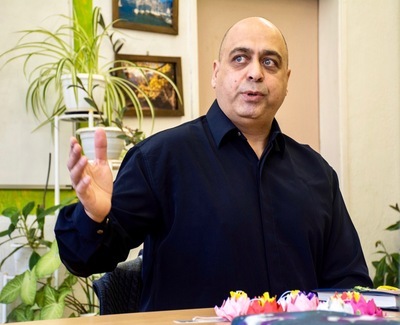 Kostadin highly appreciates the efforts of the Falun Dafa practitioners from the city of Stara Zagora, who continue to pay regular prison visits to support him and other Dafa followers. According to Radost Naidenova, who manages the Social Activities and Educational Department, Kostadin is outgoing, responsible, and the main motivator for practicing Falun Dafa in prison. “His personal example attracts the others,” she affirms. Radost Atanasova shared that the prison management tries to implement new work models, aiming and focusing on the positive and strong qualities of the prisoners. We left the prison without any prejudice, realising that between those walls are living, working people with dreams. Kostadin’s dreams are also living: to attend an international Falun Dafa experience sharing conference (Falun Dafa has practitioners in 114 countries) and to listen in person to the voice of his Teacher. He also wants to share with more people about the life-changing effect that following the principles of Truthfulness, Compassion, Forbearance has had on him.